Mr Shawn's dream birthday 24 hours in Paris - walking lots, a Laetitia Sadier gig and foie gras. 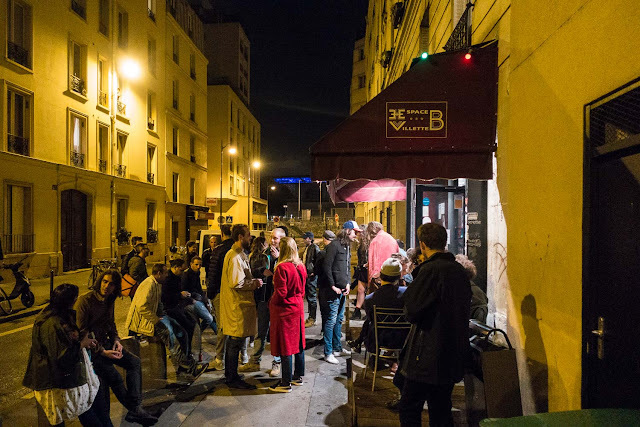 Everybody has their idea of what a dream 24 hours in Paris would be, ours begins with a beautifully dingy music venue in the 19th arrondissement. We are massive music nerds and our happiest-of-happy times are seeing bands in tiny venues - and one of the happiest moments of our lives is when Superbravo take the stage (other two top happy moments are seeing Black Cab in their full band phase in a shed in Marrickville, Polysics in tiny bar in Tokyo). 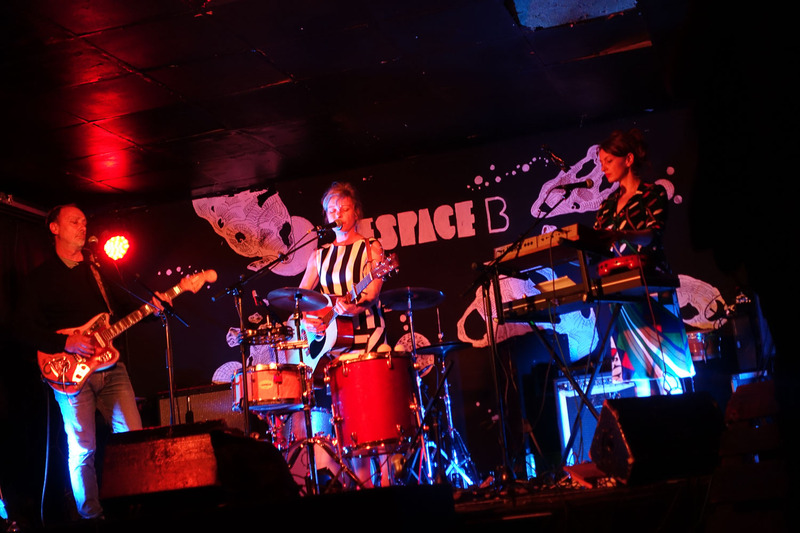 Superbravo is a dream band for us - two super pretty ladies in super groovy dresses and a super innovative guitarist singing quirky, folksy tunes in French. We don't understand a word but the sound of French in song makes us weak at the elbows. Alison stalked the the lady in the stripey dress and demanded to buy all their CDs, we think it weirded her out a bit. 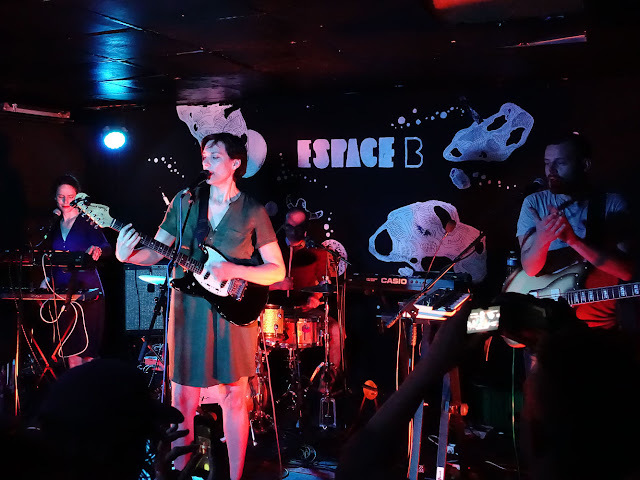 But the reason we were here was to see the headline act, Shawn's penultimate music idol, Laetitia Sadier, playing with her most amazing band, Laetitia Sadier Source Ensemble. It's a minor exaggeration to say that Shawn travelled from Sydney to Paris just for this gig - his only regret is being too shy to speak to Laetitica at the merch table. As Bobby says in The Sopranos - "Shyness, it's a curse". There was a small film crew at the gig though we can only find two tracks online, danggit. We were blown away by the inventiveness of the band which has led us down a wonderful musical rabbit hole - pretty much the same band changed positions to make an album as Little Tornadoes, and the multi-talented drummer, Emmanuel Mario, is also the producer and releases his own stuff under the name Astrobal. The sorta-funny thing is that last time we were in Paris we were here for a whole month and didn't have a scrap of luck finding interesting live music. And here we are with Shawn's penultimate favourite musician playing the night before his birthday. Thems the breaks. 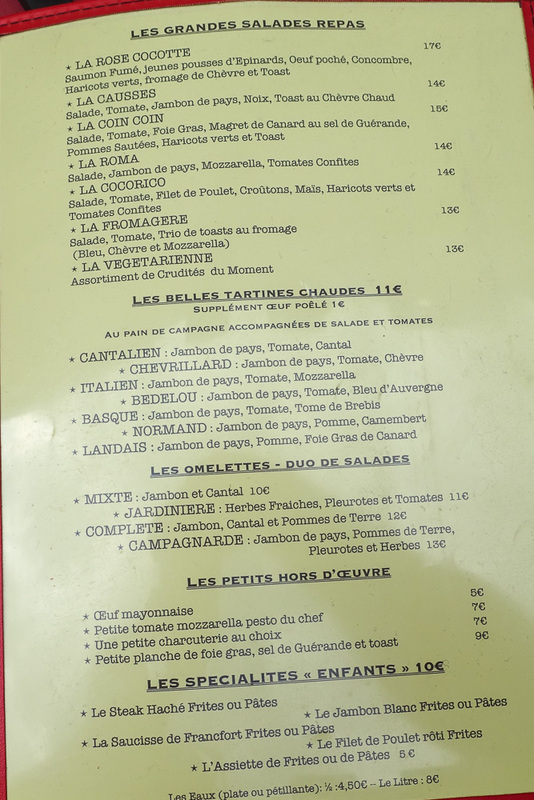 Of course the biggest decision was where to eat when we have just one day in Paris. As we mention as often as we can to nobody who will listen, we spent a whole month eating everything we could in this city back in 2014, so choosing one meal for lunch, the most important meal of the day, should be difficult. But is was surprisingly easy. One of Shawn's all time favourite meals was had at the bustling yet humble La Chope Daguerre on Rue Daguerre. 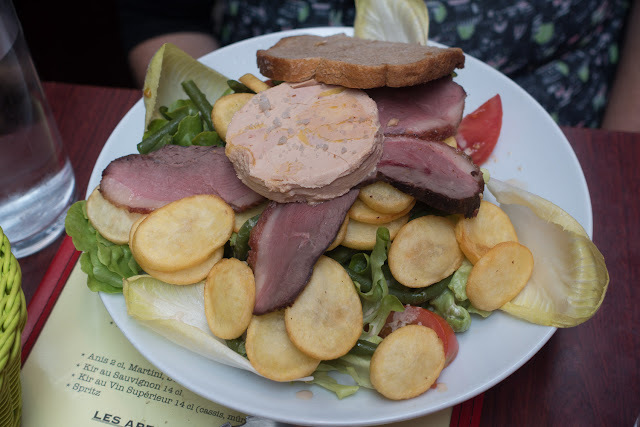 We had exactly the same meals as last visit - Alison goes for La Coin Coin - a salad of lettuce, tomato, green beans, endives, with lovely discs of sauteed potato, topped with duck breast and foie grais. This is the dish that started our obsession with French salad, and the heavenly, fatty, guilty pleasures of foie grais. 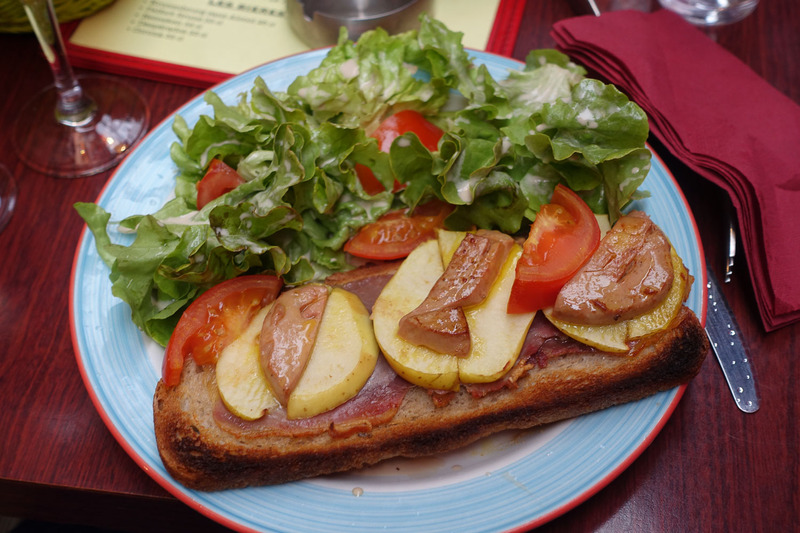 On a similar theme is this tartine, an open sandwich of cured ham topped with apple and seared foie grais, with a salad of lettuce and tomato on the side. This is still Shawn's all-time favourite feed, tied with the beef cheeks with foie grais at Au Petite Cafe in New Caledonia. Lunch is topped of nicely with lemon sorbet, and a couple of glasses of rose. 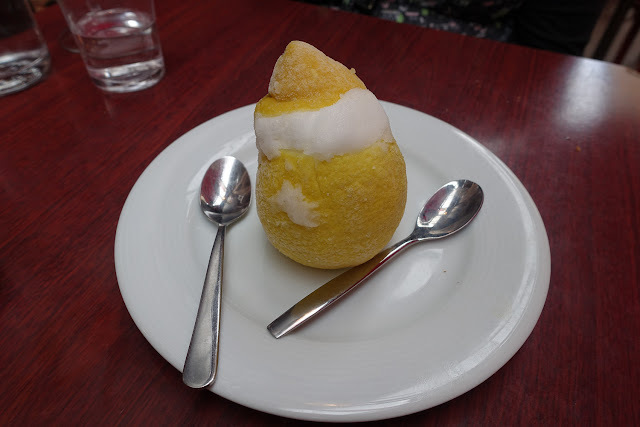 Other resto pics shortlisted from our previous trips was Cafe Pinson - a vegetarian cafe where we had the most perfectly cooked veggies ever, and La Quincaillerie if we happened to be in Rue Faubourg Saint-Denis, one of our favourite spots in Paris. 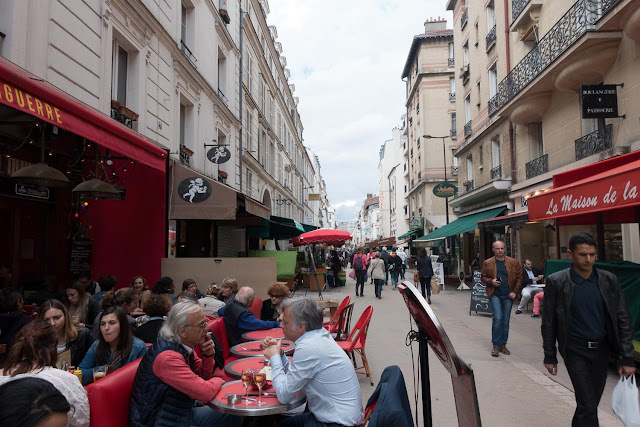 Though for lunch in Paris you don't need plans or reservations, if a resto looks good it is probably going to be. Had the day have been longer we would have squeezed in some galleries and scoured record shops for French New Wave vinyl, but we spent most of the day just wandering the streets. Had we eaten our breakfast croissant in a cafe and not the crappy hotel buffet, it would have been perfect. 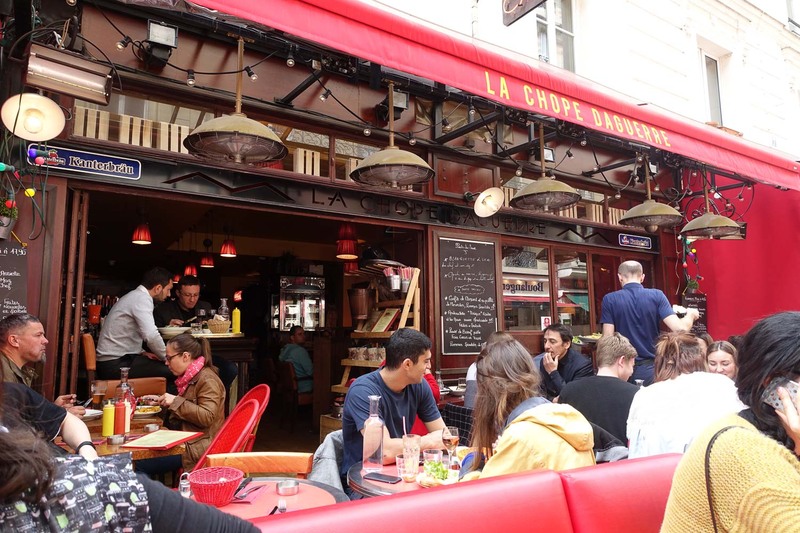 La Chope Daguerre is at 17 Rue Daguerre, Montparnasse in the 14th Aggrandisement. This street is worth visiting itself, especially if you find yourself visiting the catacombs.